of any file or folder stored in Google Drive, including the file or folder owner’s name, the last time it was opened or modified, its location, and more. With this launch, you’ll gain that same capability in Google Docs, Sheets, and Slides on the web. To see details of a Google document, spreadsheet, or presentation, simply select Document details from the File menu. Today, you can view the details of any file or folder stored in Google Drive, including the file or folder owner’s name, the last time it was opened or modified, its location, and more. 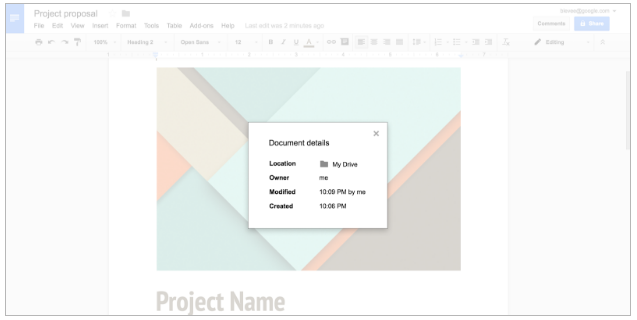 With this launch, you’ll gain that same capability in Google Docs, Sheets, and Slides on the web.